Demand Generation has special requirements, especially now. It has to combine skills in multiple areas – Marketing, Sales, Database and Content Management, Online and Automation Technologies, as well as Regulatory Compliance – and tailor them to your specific needs. Do you need all those capabilities? Maybe not. But the agency you’re looking for should handle them all. 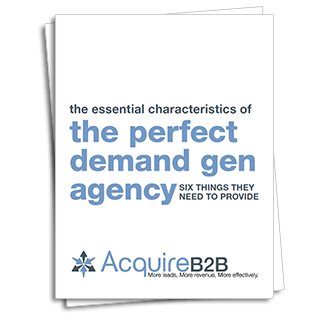 Learn why in The Essential Characteristics of the Perfect Demand Gen Agency.